Cooling Pad for Laptop is an external external device for laptops. It helps in dissipation of heat emitted by the components of the machine due to intense load. For the desktops, there are several options for effective cooling like adding an additional cooling system for the processor, changing the cabinet etc. But for a laptop, the options to use cooling are practically limited. This problem is magnified when the laptop is used for prolonged period or high working load is given and can be solved by using a Cooling Pad for Laptop. Since several years, the performance of laptops easily can compete with a Server or a Desktop. But miniaturization of the desktop made sacrifices the laptop cooling because the volume is much smaller to be circulated and the number of fans are lower too, typically when on battery these too switches off in order to save the battery. In some situations, professionals put their machines to work with 100% CPU load, which can cause a crash of the machine for critical overheating or can hibernate it. Added discomfort to the user is related to the heat that is transmitted through the keyboard and the area surrounding the touchpad and the noise generated by a fan sometimes becomes pathetic. Active Cooling Pad for Laptop is a kind of plate like device having approximately the same width and the same depth as the laptop and measures a few centimeters, on which the laptop sits on. 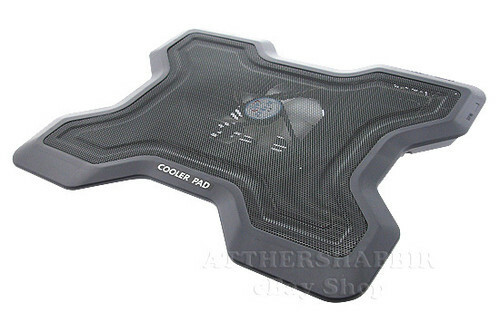 Active Cooling Pad for Laptop is most commonly used Cooling Pad for Laptop and are made of plastic or aluminum. Active Cooling Pad for Laptop contains one or more fans (with or without LED light) arranged horizontally and in different formats. Most models have 1, 2 or 3 fans, with an average diameter of 70mm. Some Active Cooling Pad for Laptop provide a single high performance fan, but a very large diameter exceeding 200mm. The fans of these Cooling Pad for Laptop are powered by one or two ports USB or via an AC adapter. A switch generally allows the fans to stop, sometimes it is a potentiometer adjustment which adapts the fan speed itself. The vast majority of Cooling Pad for Laptop breath fresh air. For making the heat transfer most effective, an active Cooling Pad for Laptop is littered with vents on the top and vents on the sides (for better air intake outside). Tilting dock : Active Cooling Pad for Laptop in addition to cooling can be used to tilt a few degrees, providing more comfort in typing and reading. The angle can be adjustable too, depending on the model. In addition to the inclination, the device may have a palm rest in the front avoiding the laptop to slip if the inclination is large, which provide more comfort and less fatigue to the user. An USB is added often. Some Active Cooling Pad for Laptop has Reader memory card for digital cameras, camcorders, MP3 players and other mobile devices. Some Active Cooling Pad for Laptop can be folded in half for easy transport and storage. The aluminum shelf type Passive Cooling Pad for Laptop: It looks like an active Cooling Pad for Laptop, but the interior is empty and placed in the open air. Fins and heat pipes provide dissipation of heat in contact. Cooling Mat or Colling Blanket: This is generally a flexible and has appearance of a quilted fabric. The interior contains sodium sulfate decahydrate, Which is solid when cold and becomes liquid under heat, thus uses the physical and chemical property of it. These passive Cooling Pad for Laptop devices are effective, but to a lesser extent, they become ineffective during prolonged use of the computer. Advantage lies in the absence of energy consumption, no noise and ease to fold and carry. It is important to note that all Cooling Pad for Laptop are not suitable for all, for the simple reason that the stand is variable in dimensions (width and depth) must be greater than (but not too much) or equal to the laptop. Too small Cooling Pad for Laptop can limit the effectiveness of cooling. This Article Has Been Shared 5553 Times! Convert Vinyl Records and Cassette Tapes to Digital Audio seems a bit old repetition in 2013. But restoring old personal recordings is still important. Central Processing Unit or CPU is a machine or an electronic circuit, which controls commands entered through the machinery or electrical circuits. Cite this article as: Abhishek Ghosh, "Cooling Pad for Laptop : Chill your Machine," in The Customize Windows, September 4, 2012, April 25, 2019, https://thecustomizewindows.com/2012/09/cooling-pad-for-laptop-chill-your-machine/.